I struggled for a while before deciding to write this post. 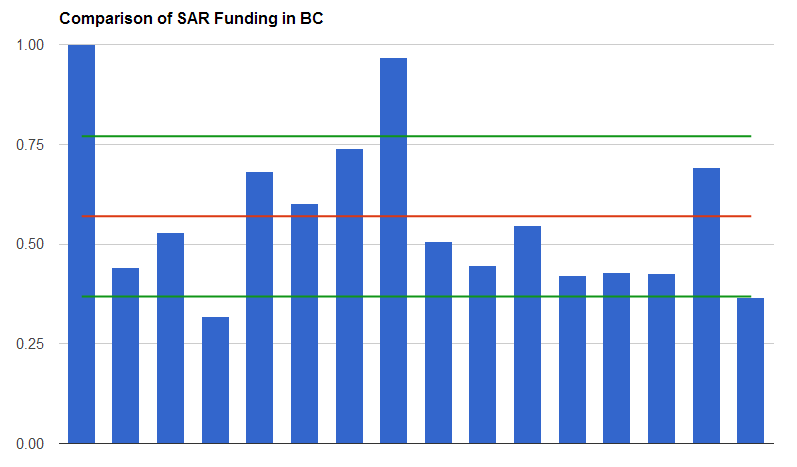 The purpose of this post is to illustrate that there is a disparity in SAR funding across teams in BC. This is not intended to show that SAR does not need or deserve your support as it is my opinion that SAR is greatly underfunded. For more on this see the end of the post. Note updated chart with more recent numbers (analysis stays the same). One of the areas that could be improved for Ground Search and Rescue in BC is the funding model. Currently each SAR team is responsible for its own fund raising. Each team can have a variety of different funding sources. Some teams are fortunate to have the support of their communities for buildings, trucks, and perhaps even some communications and a yearly grant, funded through the community tax base. Other teams get no such long term stable funding — in fact most teams do not get long term, multi year, stable sources of funding, and so they are not able to do long term planning. Sources of funding include individual donations, funds raised through various drives and events, regional district grants, grants from community casino funds, and grants from the BC Gaming commission. The BC Search and Rescue Association applies for grants for equipment and training and disburses these to the SAR community as well. EMBC has a certain amount of funds allocated toward SAR training. There are also donations of equipment and other resources that SAR groups can make use of — discounts for charitable organizations, and “Pro Deals” for equipment. Fund raising can be a struggle for a SAR group, eating into the time that could be spend training and operating the team. However, another issue that has always bothered me is that there is no body that oversees funds and grants and allocates resources to where they are needed most. It’s this issue that I find particularly bothersome. I’ve always had the feeling that there is a disparity between the resources a SAR group needs, and the resources they receive, and this results in a different level of service depending on where you are in the province, as certain teams make do with less. Most SAR groups in BC are registered charitable organizations and as such their tax returns are public documents (you can search them here). Based on my previous post on call volumes, I took the top 16 busiest SAR groups in BC, and downloaded their tax returns over a three year period and averaged them to account for variations in funding year over year. I divided the team’s reported annual revenue by the average number of calls the team did over a 10 year period. Then I converted the values into a percentage of the team with the highest ratio. This has the effect of expressing the cost per rescue for a team as a percent, which is a valid way to compare across the teams, and has the added value of making the chart anonymous (I removed the team names from the chart). I would have preferred to have compared the 10 year average revenue with the 10 year average call volume, but the CRA web site does not have 10 years of tax returns on file. The bar chart below compares the cost per rescue of the top 16 SAR groups in BC by call volume. The chart compares the cost per rescue of the top 16 SAR teams by call volume in BC. In total there are 80 SAR teams in BC. The red line is the average (53), and the green lines represent the standard deviation (20) which is quite high. The first way to interpret this chart is that the bars express the cost-per-rescue for each SAR team in unitless values (percentage is a ratio and has no units). You can see that some teams have a much higher cost per rescue than others. Another way to interpret the bars is this; the shortest bar is 29%, the largest bar is 100%. The small bar represents a SAR group whose funding per incident is 29% of the largest team, or lower than a third. The disparity is unsettling to me. In an ideal world I would hope that this chart would show the same cost per rescue for any team in BC, indicating that each team receives funding roughly on the same order as their call volume. The standard deviation indicates that the majority of teams in this sample are within 20% of the average. This is quite a large spread — consider the last time you overspent on something by 20%, or saved 20% when you bought something. This comparison is only 16 SAR teams — and those are the busiest Ground SAR groups in BC! As I mentioned in my last post, these teams are dominated by the largest population centres in BC, and large call volumes which give them exposure in local newspapers, and the ability to raise funds through donations, and justifications for large grants. Imagine the disparity between the 10 busiest and 10 least busy SAR groups (possible in another post). However, without a central body to evaluate the merit of a grant application or to monitor how “rich” a team is, some groups are clearly falling behind, even in the top 16. For full disclosure, my own SAR team is just above the median in this chart at 60 so we are doing OK in comparison — with the top team having just 40% more funding per call than us. I believe most Ground SAR groups are under funded in BC and that the struggle to fund-raise takes time and energy away from the primary job of rescuing people. I believe that Ground SAR in BC deserve simple, stable, long term funding that will allow SAR groups to plan for multi-year projects to prevent death and injury, and to build skills where they are needed. I believe that Ground SAR in BC needs an oversight body that can help make the distribution of resources equitable so that funding goes where it is needed, not where it is popular or visible. I think that if you are considering supporting your local SAR team you should continue to do so because they need it. I have deliberately left this analysis anonymous to avoid the impression of some teams being less deserving than others. Support your local team, but understand that there are 80 teams in BC and not all of them are funded to the same extent. For any provincial organizations, if you are interested in supporting the mission of Ground SAR in British Columbia, I would consider donating to the BC Search and Rescue Association as the only body in BC that represents the 80 SAR EMBC-recognized SAR groups, and the thousands of volunteers who serve. BCSARA are the central body are they not, they should be overseeing how funds are distributed especially the gaming grants and I believe that gaming have asked for their help in this. It has always been my view that rather than individual groups applying for gaming grants the gaming commission should look at what they give to SAR as a total each year and instead give this to BCSARA. Groups then apply to BCSARA for funds which should therefore be a simpler process for the groups as the application forms can be SAR specific requiring less time to fill in. Is the gaming grant system also not flawed in that to be eligible for a grant you cannot have more than 50% of the previous years operating costs in non restricted cash. This in my view almost forces groups to spend money in order to be eligible for a grant which does not seem to be encouraging fiscal responsibility; I am not saying groups are fiscally irresponsible just that the system encourages this leaving groups in a difficult position in that they have to spend money with no certainty the grant will be approved possibly leaving them low on funds the subsequent year. Another important side of this issue is that some costs are fixed and are not dependent on the number of rescues performed. Equipment needs maintenance, gear needs replacing, insurance and rent are due, all costs that occur regardless of the number of calls a team answers. Current provincial call reimbursements fail to cover the true operating cost for less busy teams. I would hope that a supportive funding model would include a component to help cover the basic operating costs that all teams must pay. Basing funding strictly on how many calls a team answers would negatively affect teams that need to maintain the same operational capabilities of their busier counterparts. There are two initiatives underway that relate to this issue; BCSARA at the last board meeting supported development of a proposal to assist Gaming in the allocation of funding to SAR groups, the second is updating a ‘Alternative Funding model for SAR in B.C’ paper for resubmission to the Province with the intent to form a dedicated SAR Fund that most sources of funds would flow into and then be allocated to SAR Groups. Several states including Colorado use that model, although the scale and scope are much larger here. We heard the same issues through the ‘Leveling the Playing field’ regional sessions, just not articulated as well! Mike…great blog! I agree with the first 2 points that you are advocating. Your 3rd point, to create an “oversight body that can help make the distribution of resources equitable so that funding goes where it is needed, not where it is popular or visible” would likely not be as simple/effective as one might think at first glance. We have the “Levelling the Playingfield” mandate at present, and I believe it has helped somewhat to make training more reasonably accessible across the province, but funding is a much more difficult thing to make “equitable”. Gaming funds would likely be the easiest government “funding source” to make equitable, and perhaps they already are. I do not see how municipal governments could ever fund their respective teams equitably. The variations in tax base makes it impossible. Donations received by SAR teams is one funding category that will always be skewed in favour of . The numbers are truly astounding. BCSARA has no authority over independent (individual) SAR team societies’ revenue, nor should they. Overall, the province’s SAR teams are much better off financially since they have been able to access Gaming funds. BCSARA has contributed as well perhaps moreso as an advocate rather than in terms of providing direct funding. Keep up the great work with the blogging! Re: Charles’ post…the SAR Advisory Committee and then BCSARA have long advocated for the less busy teams. Some creative solutions were presented to PEP/EMBC/GOVERNMENT but they were not willing to implement a “front loaded” type of re-imbursement system that would have benefitted such teams. Great points Doug and I agree there is no simple solution. One model proposed would be to have the regional districts pick up the funding “tab” based on a “mill rate” (defined here: https://en.wikipedia.org/wiki/Property_tax) which would be based on property values. It’s an attractive model for SAR since the regional districts extend beyond the boundaries of a single municipality, and most of the SAR groups serve more than one village/hamlet/city/municipality. Since the Regional districts derive their funding from property tax and transfers from the municipalities it would be taxpayer funded. Some regional districts fund teams already but to vastly different amounts. Since the service provided by regional districts include fire control, adding SAR as a service to this level of government would also make sense since it’s a similar model. I have a lot of hope that this is how things will go for steady, population-based funding in the future. If BCSARA had an agreement with the BC Gaming commission to vet all applications for grants this would go a long way toward maintaining equity among the teams. For instance, RCM-SAR has a model where the individual teams are on a schedule for gear replacement so there is a system in place for grant applications. Not sure of the details, but they are quite proud of the system as they have worked very hard on it. As far as any funds raised by local fundraising, you’re entirely correct that each team is in charge of it’s own finances and donations received this way would rightly belong to the team, UNLESS they felt charitable about it and put it into a put for the greater good. Taking a quick look at some of the numbers and I see a real problem with this data. You already eluded to the fact that you would like to have accessed more than 3 years of data, but that it wasn’t an option. As a result, teams that made significant infrastructure acquisitions in the last three years will appear to have a much higher $/call number than would show if averaged over a longer time horizon. For example, our team made significant fund raising push to acquire a special piece of equipment. (one which currently we can’t use, but that’s another issue) The cost in one year was about 30% over our regular operating expenses. As a result, using your data, our team would appear to spend 10% over our normal expenses. Imagine if a team built a new base? I would think a longer, 10 year? cycle would much more accurate. Something that better amortizes the cost of trucks, boats, HETS kits, hovercrafts, drones, or whatever other fund and costly toy a team can dream of spending money on can be better averaged. Tom, that’s a good point and in an ideal world we would make a long term comparison. It’s entirely true that a single year comparison only shows the picture for that year. I ended up averaging up to three years for this chart in an attempt to smooth out the changes… with very little change in standard deviation or in the lowest to highest ratio (29%). It’s also true that year over year call volumes can fluctuate by 20% for some teams. However I’m not trying to make a point that any particular team is consistently high or low, more that there is a huge disparity. If I include the “bottom” 10 teams next week I’ll be able to make that point even clearer – I am fairly confident we will see an order of magnitude difference (factor of 10) between the highest and lowest funded teams. Knowing that the amount of calls as well as types of calls are extremely variable, you may have to go twenty years to even things out, and even that may not work. Logic would dictate that the most expensive searches are in the area where teams are spread out and have to cover larger area’s, but I would venture to guess that this is not the case. More than likely the most expensive searches are the one’s that get the most media coverage, or is it the cost that is bringing the media in? (not likely! ), probably like most emergencies “The importance is directly proportional to distance from the closest media outlet”, hence searches in the lower mainland and island would get more coverage and be perceived as more important. A question was posed to me by email regarding the stats in this post. To make the question anonymous, the jist of it was how do I account for one-time-only expenditures that might raise the average cost-per-rescue for a team. The answer is that I don’t — the stats here are based on an average for several years of tax returns. I can’t account for any one-time-only costs. However, the justification for this is that teams all over BC are always fundraising for these large, one-off purchases such as a new truck, or a new SAR hall — for instance at least four SAR groups are either in the process of building, or have just built a SAR hall. SAR groups building a hall may take three or four years to raise funds for construction, and then will need to continue to raise funds for maintenance and services for that new hall. Similarly, a vehicle will have ongoing costs. The one-time cost becomes the start of a new minimum funding level for the team, as the lifetime servicing costs of the new acquisition are easily larger than the single cost of purchase. The other rationale is that averages over time will smooth out the blips of these one-time costs. To answer the email’s other question, the SAR group you referred to was more than a standard deviation away from the average before and after the most recent tax returns, changing place with one other team. 3 Pings/Trackbacks for "Comparing SAR Funding in BC"